"Elegant, delicious and simple to prepare. The fontina cheese is creamy, rich, and nutty. Fresh sage leaves, browned in butter, give this dish a unique taste. It can be altered for calories and fat content easily. The sauce is optional; pour it over the chicken before serving." Heat 1/4 cup butter in a large skillet over medium heat. Allow butter to foam; add sage leaves and cook for 1 to 2 minutes per side. Remove and reserve leaves; reserve butter in the skillet. 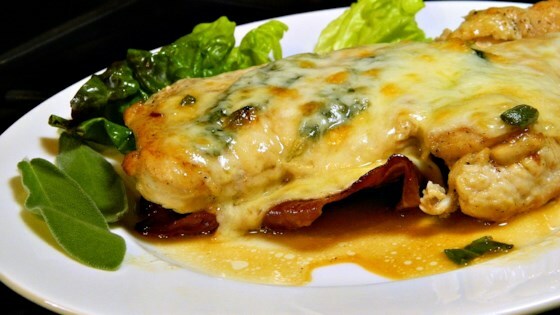 Place 1 slice of prosciutto on each chicken breast. Put chicken, prosciutto side down, in the warm skillet with reserved butter. Cook chicken over medium heat until no longer pink in the center and the juices run clear, 5 to 6 minutes per side. An instant-read thermometer inserted into the center should read at least 165 degrees F (74 degrees C). Transfer chicken to a baking sheet, reserving skillet contents. Layer 3 sage leaves and 2 slices of fontina cheese on each chicken breast. Broil until cheese is melted, 3 to 5 minutes. Add wine to the skillet used to cook the chicken. Cook and stir over high heat, scraping the bottom of the skillet, until reduced to 1/2 cup, about 5 minutes. Add minced sage; cook and stir for 1 minute. Whisk in 1/4 cup butter; reduce heat to low and simmer for 1 to 2 minutes. Serve sauce alongside chicken. Two classic comfort foods in one delicious entree! You can adjust the recipe to eliminate the butter as you see fit. You can cook the chicken with a low-calorie cooking spray and use no butter except for the sauce and also adjust that accordingly. You can use sherry or Marsala wine in place of the white wine. If making the optional sauce, feel free to add salt, pepper, or other seasonings as you prefer.